Turning the page to a grammatical error or misused word can easily distract a reader, not to mention steer an audience away from your content. Even though these grammar errors were accidental, they can make you look bad and damage your effectiveness towards your audience. Whether the errors occur in your book, blog or slideshow, your creditably will diminish if your words are not used properly. 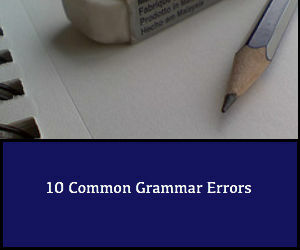 Avoid the embarrassment and present credible information to your audience by using the following 10 common grammar errors as a reference when writing great content. Principal – (n.) means in the highest rank or the main participant; (adj.) the term means the most important of a set. Principle – (n.) means a fundamental truth, law or standard. Complement – something that adds to or supplements something else, or the act of doing so. Compliment – something nice someone says about you. Its – The possessive pronoun, as in “this info graphic has got its groove on.” Try this rule: Say the sentence out loud using “it is” instead. If that sounds wrong, then “its” is likely to be correct. Then – Can have a variety of meanings including “at a point in time” or “in addition to.” Follow this rule, use the word “than” when comparing and “then” in all other instances. Who – (subjective – nominative – pronoun, along with “he,” “she,” “it,” “we,” and “they.”) This word is used when the pronoun acts as the subject of a clause. Whom – (objective pronoun, along with “him,” “her,” “it”, “us,” and “them.”) It’s used when the pronoun acts as the object of a clause. This word is used when the pronoun acts as the object of a clause. Using “who” or “whom” depends on whether or not you’re referring to the subject or object of a sentence. Use “who” when the subjective pronoun is “he” or “she”, i.e. Who is marrying you? He is marrying me. Or substitute “whom” with the objective pronouns “him” or “her”, i.e. I hired an attorney whom I met in California. I consulted him. Which – When using “which”, you’re being introduced to a relative clause. It allows qualifiers that may not be essential. i.e. I advise you to eat only organic peas and carrots, which are available at the farmers market. In this scenario, you don’t necessarily have to go to one specific farmers market, but any farmers market to purchase organic peas and carrots. That – (restrictive pronoun) It’s critical to the noun of which it’s referring. i.e. I don’t eat peas and carrots that aren’t organic. “That” is referring to non-organic peas and carrots, meaning I only trust peas and carrots that are organic. Think of it this way, “which” qualifies, and “that” restricts. According to Litreactor.com, “which” is more ambiguous however, and by virtue of its meaning is flexible enough to be used in many restrictive clauses. e.g.,The house, which is burning, is mine. e.g., The house that is burning is mine. This negative condition literally means “and not.” Use the word “nor” if your sentence expresses a negative, followed with another negative condition. i.e. “Neither he nor she are real estate investors.” This sentence verifies that both he and she both held the same negative condition of not being real estate investors. However, if neither “either” nor “neither” is used in that sentence then you should use “nor” to express the second negative (as long as the second negative is a verb). If the second negative is a noun, adverb or adjective, then you would use the word “or” because the initial negative transfers to all conditions. i.e. I won’t eat salad or soup. The negative condition expressing the first noun (salad) is also used for the second (soup). May – Implies the possibility. i.e. “You may go to the store if you find the keys first” implies the keys are lost. Might – Implies far more uncertainty. i.e. “You might have to walk if you can’t find the keys” implies the possibility of not finding the keys. The next time an author or presenter publishes a grammar error or misuses a word in a sentence, acknowledge your expertise by directing them back to this blog to correct their errors.